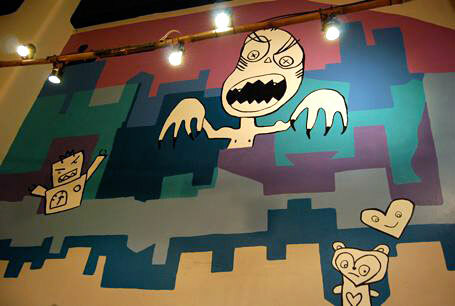 HOME | indie blog | i love lenko! Designer Dana Lenko has been injecting colourful cheekiness into Melbourne fashion for over a decade. 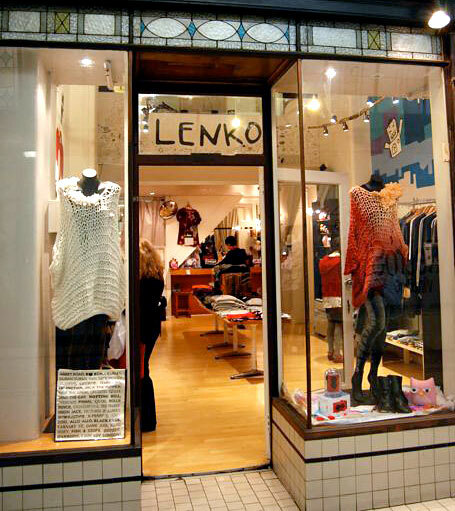 The Lenko boutique, which moved from Melbourne Central into the lovely Cathedral Arcade a year ago, stocks local, interstate and international designers as well as the Lenko label. 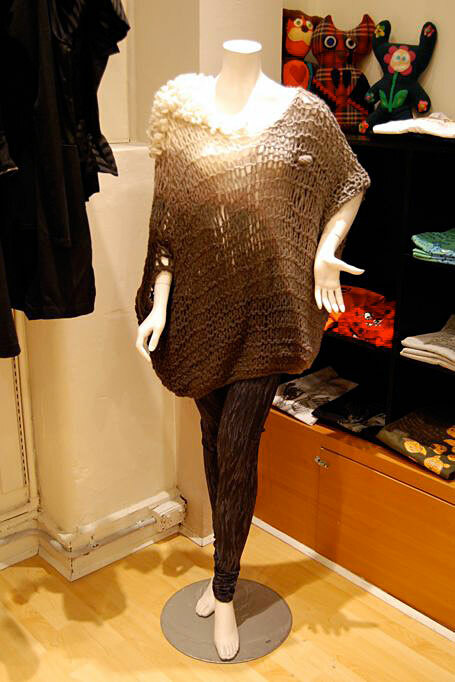 Super-chunky knitwear by NZ designer Salasai available from Lenko. 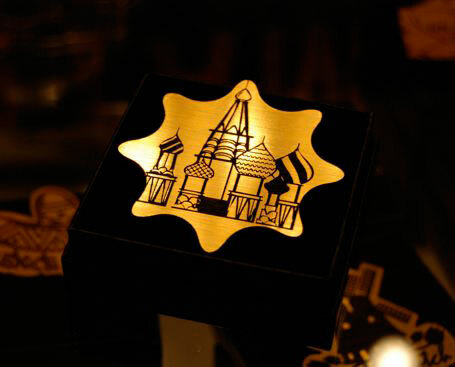 Russian-inspired brooch by Limedrop available from Lenko. While studying art and film at the VCA, people would approach Dana to ask where she bought her skirt, jacket or top, only to discover that the garments had been made by Dana herself. Was this a sign? She soon turned to creating 'cute clothes with a dark side', for girls and guys, and now ships to customers internationally. 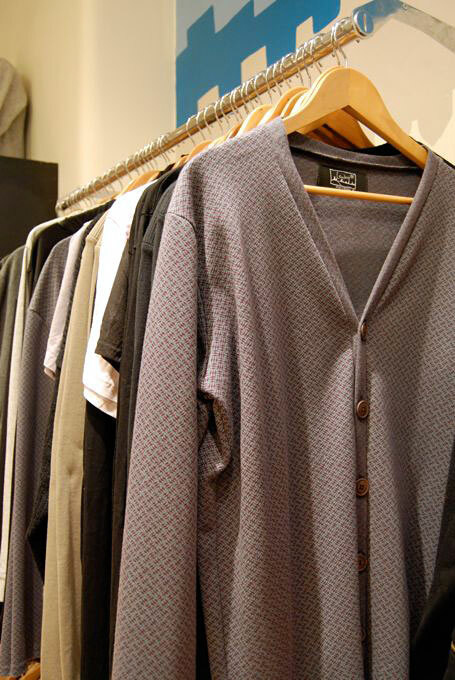 Plenty of great tops, jackets and tees to please the guys available from Lenko. Dana's use of delightful fabric, both new and vintage, pair well with Lenko's quirky designs. The floral leiderhosen short-shorts from Lenko's last summer range sold out in no time! 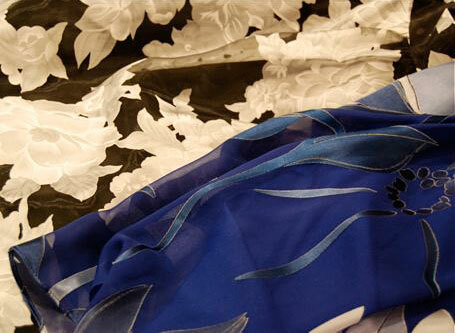 'Blue Lily Drop Skirt' & 'Flower Power Skirt' skirts (AUD $139.00ea). Without a doubt, Lenko is an animal lover. Camels, poodles, fruit bats and sloths are just a few of the creatures who've been honoured on tees and sweaters for both guys and girls. Funny printed tees and sweaters are a (collectable!) Lenko staple. 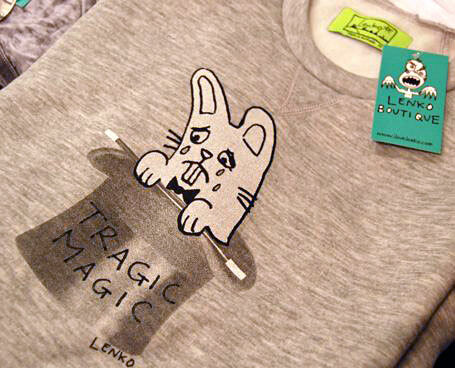 Tragic Magic Sweatshirt currently on sale from Lenko (AUD $69). Lenko are about to release the next range of hand-cut-animal sweaters. Fans of Lenko were invited to vote for their favourite animal - now four lucky creatures are being morphed into a Lenko collectable as we speak! The toucan, seal, unicorn (yes, it is real) and lemur will grace the front of these very-limited edition sweaters - only 30 of each are being made! Each animal is hand-cut from several pieces of fabric, stitched together, than sewn onto each sweater. They're so cool they even get their own launch party on June 3rd! The zombie that graces Lenko's wall, business cards and swing tags is an illustration Dana did for a t-shirt a couple of years ago. The 'flesh eating zombies ruined my birthday' tee was such a hit, the zombie has become a permanent fixture. 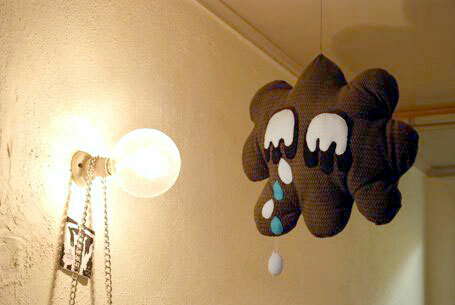 "He reflects the persona of Lenko; a bit dark, cute, awkward and a bit random," says Dana. 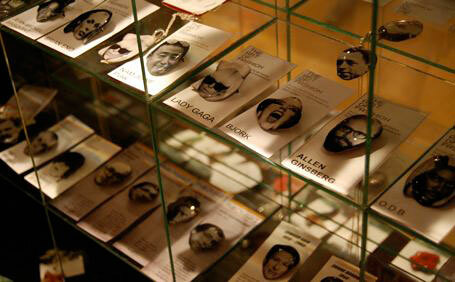 Famous-faces brooches and necklaces from PHILOS-o-FACE available from Lenko. Lenko is so much more than a Japanese parsnip. It's 'for lovers of randomness' and for those that appreciate a playful, home-grown Melbourne style. Lenko is having a studio sale on 11th & 12th of June. 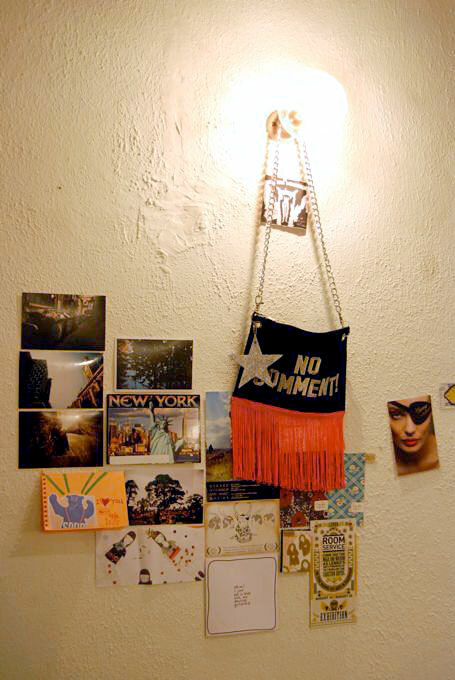 Dana shares her Collingwood studio with another Melbourne creative, Hannah Chipkin - the gal behind Chip Chop totes. Hannah's bags will be joining the sale too! For more info & unique finds, visit the Lenko web site and online store at www.ilovelenko.com. For launches, sales, news and updates, visit the blog: http://blog.ilovelenko.com. 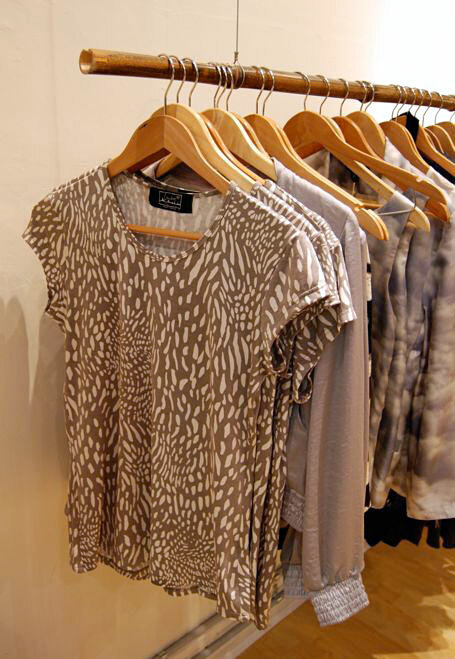 Lenko is located at Shop 5, Cathedral Arcade - Flinders Lane, Melbourne. All photographs by Emma Starr.